MY MOM’S A SNOOP AND SO AM I! I write in a diary like you and lately my mom has been asking me questions that relate to my entries. 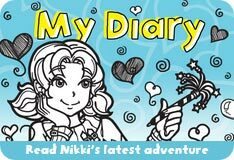 I was snooping around when I found my diary in my mom’s closet. I got angry but didn’t tell her. What do I do?! Oh yikes! This is tricky! I’ve gotten letters from readers whose parents snooped in their diaries before. But this is complicated, since the only reason you know she snooped is because YOU were snooping!!! I’m thinking about WHY you’re both feeling the need to snoop. I think when parents snoop into kids’ lives (not just diaries, but sometimes they’ll go through their rooms, or social media accounts), it can be because they’re worried. Maybe they’ve noticed their kid seems different lately – sad, angry or preoccupied – and they worry about the reason for the personality change and go looking for answers. But, they must go looking for answers since they don’t think they’d get answers by just asking. Hey, it would be a LOT easier to just ask, right?! But I know that when my parents ask me how I’m doing, I usually just say, “Fine” because I don’t want to spill my guts to them on every little thing. I DEFINITELY don’t want their advice on every little thing, and they will FOR SURE give it if I tell them my problems. So, there you have it. Parents worry kids aren’t telling them stuff, which makes them ask, which makes the kids shut down, which makes the parents go snooping, which makes the kids shut down even more. Because CAN A KID GET A LITTLE PRIVACY UP IN HERE?!?!? I’m curious why YOU were snooping. It sounds like it was probably because of the questions your mom had been asking, and I’m guessing you couldn’t find your diary, so maybe you were specifically looking for that. If so: understandable. But, if you were snooping for no good reason, that’s definitely something you need to think about before you go getting all mad at your mom for doing the same thing. I mean, let’s be fair. But I do know there are some moms who would only hear that you snooped in their closet and then you’d just get punished and you wouldn’t get to the heart of the problem. In that case, I’d probably leave the diary where you found it (since she’ll know you snooped if she realizes it’s missing from her closet), and ask your mom if she’s seen it, because you can’t find it and it’s really important to you. You could even tell her you’re worried someone might read it! At this point, she might admit to having it, and it could open up a conversation. But even if she doesn’t, you’ll get it back. In the future, try to be a little more open with your mom about what’s going on with your life, so she doesn’t feel like she has to go all “secret agent” on you. And find a better hiding spot for your diary! Do your parents snoop on you? Are you a bit of a snoop yourself? Has it gotten you in trouble? What does privacy mean to you? Tell us in the comments!